made this, and uploaded it 3 years ago. "i don't get paid enough to put up with this ****." this is incredible you did a great job!!! post this on tumblr! let me reblog it from you!! Cool new character bio chart. I'm a combo of "thats queen hoe to u" and "gay"
I am so happy this exists. btw this is so cute!! A good idea and really funny. Great job. I'm gonna be greedy and be both Hi I'm Daisy and I Don't Get Paid Enough To Put Up With This ****. Is it wrong that I read NERD under Daisy's bio in Homer Simpson's voice? 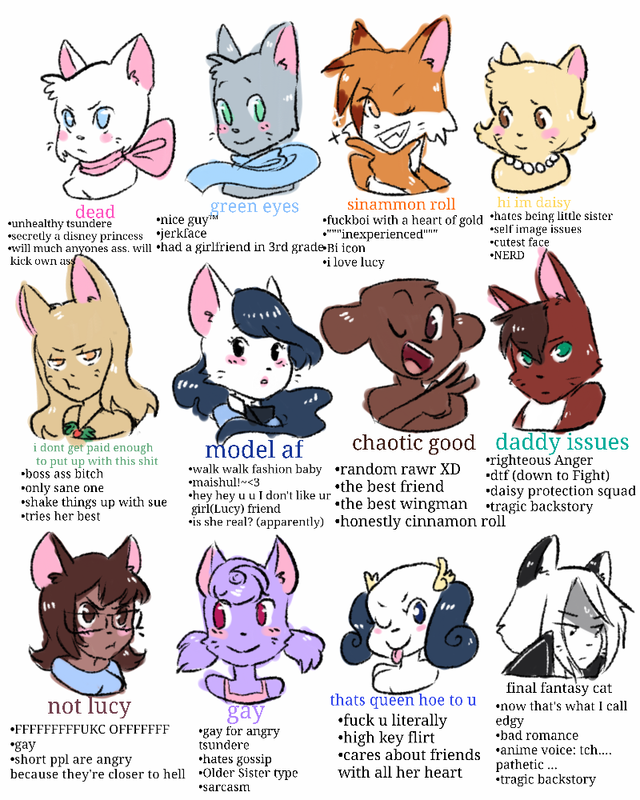 So I'm a mix between final fantasy cat and chaotic good. i really don't have a personality, do i.
I'd include hi I'm Daisy, but I literally have a face even a mother couldn't love.